For over half a century, B.B. King and B.B. 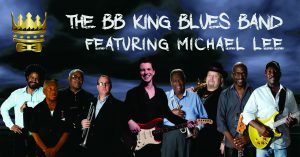 King’s Band defined the blues to the world, averaging over 250 sold out concerts per year, with classics like “The Thrill Is Gone,” “Every Day I Have The Blues,” “How Blues Can You Get,” and “Why I Sing The Blues”. 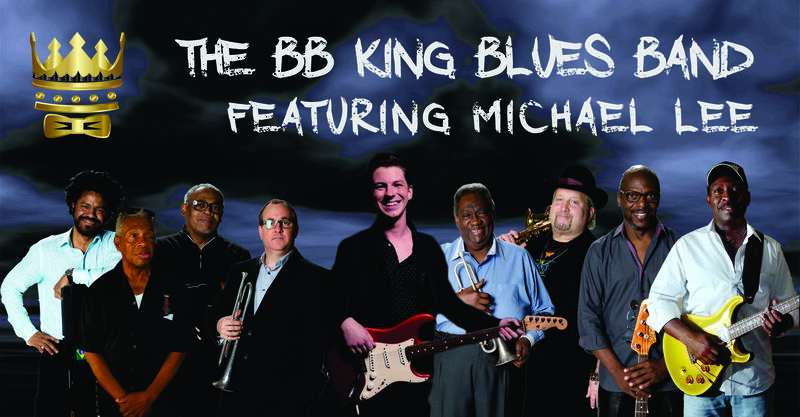 Now BB King Blues Band members have gotten together to continue touring in the remembrance of “BB King”. These original members of “BB’S band Featuring “Michael Lee” (The Voice) are touring and performing all over the world. Combining over 100 years of musical talent, this is your chance to experience and celebrate these incredible legends…LIVE ON STAGE! Michael Lee is a Fort Worth based Blues artist. Featured as a contestant for the 2018 Season of the Voice. Where his soul and energy was unmatched and unlike the show has ever seen. Raised around blues music his entire life, Michael spent the majority of his young life in blues clubs receiving an ivy league education from watching and playing with blues legends such as Andrew “Jr Boy” Jones (Freddie King), Buddy Whittington (John Mayall), Lucky Peterson (Willie Dixon). On nights he was not in the blues clubs he was down in the stockyards soaking in the Country sounds which emanated from those honky tonks. Like Delbert McClinton and many Fort Worth musicians before him, Michael’s style of music has the perfect blend of Blues and Country. Michael Lee released his first record in 2014, released two singles in the summer of 2018 “Here I Am” and “Heart of Stone” and is releasing his sophomore record in 2019. James “Boogaloo” Bolden Trumpet/Lead Vocals/Backing Vocals Born in Houston, TX, James Bolden began his musical training under the guidance of Edmund C. Broussard. Bolden later seized the opportunity to study classical trumpet under Houston Symphony Trumpeter Richard Schafer. James went on to play with local union bands that performed with a wide array of artists such as Stevie Wonder, Isaac Hayes, Temptations, Supremes, Spinners, and James Brown. Bolden eventually was given the opportunity to join the Duke Ellington Orchestra where he thrived for years. Bolden later joined the band of B.B. King and became bandleader during a stint of over 35 years. James Bolden now continues his association with B.B. King by joining B.B. King’s Band as bandleader. Russell Jackson Bass Guitar/Lead Vocals/Backing Vocals Starting his 41-year career in 1974, Russell Jackson moved to Chicago in 1976 and gained his blues stripes working with Otis Clay, Buddy Guy, Bobby Rush, and others like Charlie Musselwhite and WIllie Nelson. For 8 years, Russell toured exclusively with B.B. King as his bass guitarist for over 17 years. Jackson was the first artist to put slap bass on a live blues recording, (Live at Old Miss 1979). During the 1990’s, he recorded with Kenny “Blues Boss” Wayne on his Juno Award winning CD. In 1992, the Russell Jackson Band debuted and Jackson released three CD’s of his own material. Present day, Russell is the Music Director for the New Generations of the Blues European Tours, formerly known as The Chicago Blues Festival. Jackson was welcomed into the B.B. King’s Blues Band because of his extraordinary talent. Eric Demmer Saxophone “Hear what you feel, play what you hear.” At the age of 10, Eric received his first saxophone, so began the journey of a natural-born musician playing anywhere at any time with anyone. One night, Eric was invited to perform onstage with the legendary Clarence “Gatemouth” Brown at a Houston club known as “Billy Blues.” On that night, Eric joined Gate’s band and traveled all over the world for the next 12 years untill Gate’s death in 2005. The journey with Gate included performing as the opening act for Eric Clapton’s “From the Cradle Tour.” This gave Eric the opportunity to perform with many well-known and respected musicians, ie. Carlos Santana, George Duke, Joe Sample, David Sanborn, and B.B. King and BB Kings Blues Band. Buddy Guy, the Allman Brothers, and Dr. John were among many others. Lamar Boulet Trumpet Lamar was raised in Lafayette, LA, but got his start in the music business in New Orleans. It was there he was able to study and work with some of the legends in New Orleans such as Ellis Marsalis, his first teacher in the study of jazz. As an undergraduate, he studied with the incomparable Vince DiMartino at the University of Kentucky before receiving his masters degree at the University of Miami. Lamar later moved to Orlando and worked at Disney as a composer/arranger, musician. Carnival Cruise Lines hired him as Musical Director and he spent 4 years in charge of musicians and talent. He also toured with Grammy Award winning Latin artist, Tito Nieves. Lamar now lives in Houston, TX, where he freelances and teachers. Lamar is honored to be a new member of B.B. King’s Blues Band. Darrell Lavigne Keyboards/Vocals Darrell Lavigne has been performing on stages around the world, most notably New Orleans Jazz & Heritage Festival, Rotterdam JVC Jazz Festival- Netherlands, and Berlin Jazz Festival- Germany. Lavigne began his musical life at age 10, first on guitar then trumpet. It wasn’t until his senior year that he decided piano would be his instrument of choice. “I wanted to explore harmony and the colors of music. Piano represented that for me.” Darrell’s influences came for the usual jazz sources as Monk, Bud Powell, Ahmad Jamal, Hancock, and Corea. Charlie Parker, Coltrane, and Miles Davis rounded out the crew. Early musical exposure in addition to the mentoring by Ellis Marsalis and Edward “Kidd” Jordan helped Lavigne become one of the most sought-after pianists around. Darrell has gone on to record two albums with then Columbia Jazz Artist, Kent Jordan, write for one (Night Aire) and produce another (Out of This World). Over the years, Darrell has performed with artists BB King, BB King’s Blues Band, Kirk Whalum, Marion Meadows, George Duke, Hubert/Ronnie Laws, and Everette Harp to name a few. Though he’s respected as a pianist/keyboardist, he continues to produce and write for a number of artists. Discography: Blue Orleans (Fertile Crescent, 2000); Kidd Jordan/IAQ-Kidd Stuff (Danjor); Michael Ward-After The Kiss (Sweet Music Records, 2006).